2 words that sound so sweet when we reflect on our round 3 tussle with our close neighbours the North Sydney Bears. With the exception of 1st grade, it’s been a slow start from the Tahs this season, but wins from all 5 grades yesterday got us back on track. With rain affecting week 1 and resulting in limited play, there was a reduced number of overs to obtain a result in most grades, so to get up in all 5 was very pleasing. 1st grade produced another dominant display, thanks to 7 wickets from skipper Chris Green and well deserved half centuries to Ahillen Beadle, Chris Green and Jack Edwards, the latter 2 unbeaten. 2nd and 3rd grade got their season going with big wins, both sides defending good scores with excellent bowling and tight fielding. Sam Gainsford excelled for 3s with a 4 wicket haul, while Joel Foster showed his class in picking up 3 wickets for 2nd grade, with wickets shared across all other bowlers. Adam Gummer’s 4th grade side ended up with a solid victory to jump into the top 6, while 5th grade were without doubt the stars of the day, hitting a fantastic 1 dec 276 thanks to a Dom Wheeler century and Brynn Mendel half-century, and then a 6/33 haul from fast bowler Glyn Archer. Big weekend from the Travelsim Manly Warringah Waratahs which propels us up to 3rd in the Club Championships and gets us going for the season. 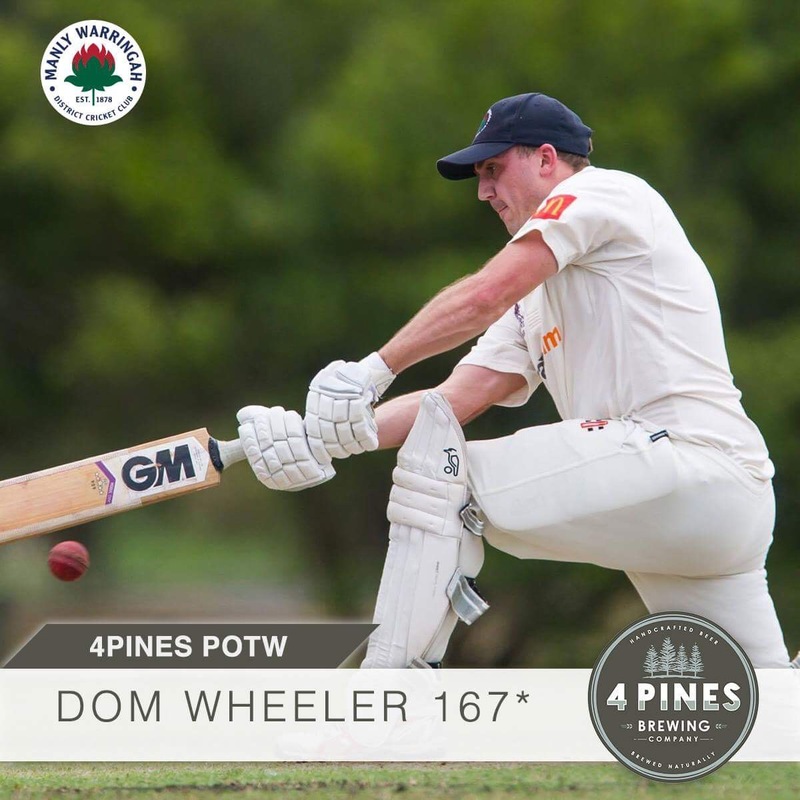 Tough decision this week with a number of outstanding individual performances, but it’s hard to go past Dom Wheeler for this weeks 4 Pines Player of the Week. Dom is one of the hardest working players at our club, and in-fact had 100% training attendance last season. He is starting to know his game well and loves scoring runs. 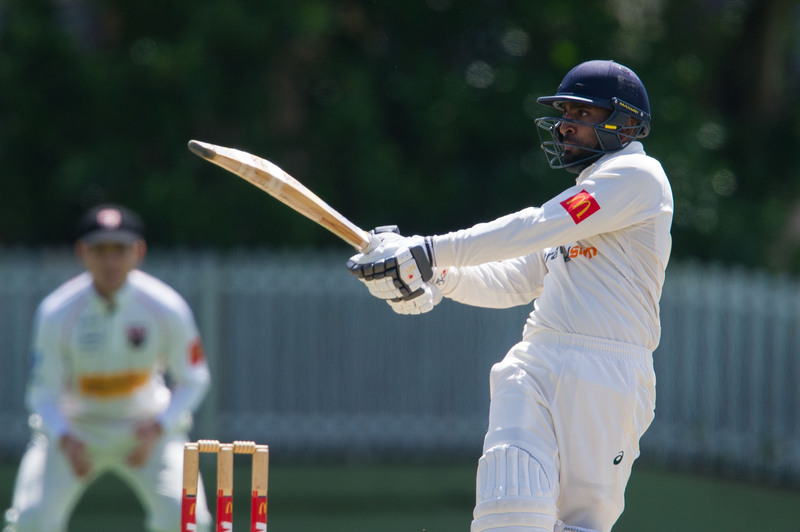 88* overnight, Dom went to his 100 first thing in the morning and then proceeded to dispatch the North Sydney bowlers to all parts of the ground as the Tahs searched for quick runs. He scored his final 70 runs in 5 overs. It was as clinical a display of hitting as we have seen in 5th grade for a while. Quality effort. fter a rain affected day 1, and with Norths sitting at 7 for 197, we resumed play at 9.30am with 120 overs in the day. Mickey Edwards slipped back into the side after NSW duties and was a huge welcome. He bowled with proper wheels and the North Sydney tail were not good enough to give an edge. This created pressure for Chris Green to capitalise on and finished off the rest of the North Sydney tail taking 7 wickets in total with a few skied balls at the end. Unbelievable effort. Just quietly, a couple of quality catches in the outfield to finish the innings as well. Chasing a score of 233, the Waratahs started well. Ahillen Beadle was looking all class and hit the best pull shot ever seen on the Peninsula. Unfortunately we lost 3 reasonably quick wickets after being 0/50 to bring Green to the crease. He and AB formed a great partnership until they had a mixup to leave them both at the same end. AB out for a classy 63, an innings that undoubtedly set us up for victory. Young Jack Edwards strode to the crease with the confidence of a 100 gamer and banged them all over the park. Before we knew it, Chris and Jack had put on 100 both amounting unbeaten 50s to take the Bevan White cup back from the bears for the loss of only 4 wickets. We sent North Sydney back into bat to the dismay of their skipper and took a few wickets but couldnt make significant inroads in the limited time. The obvious star was Chris Green but there were supporting roles throughout the game that got the Tahs over the line. 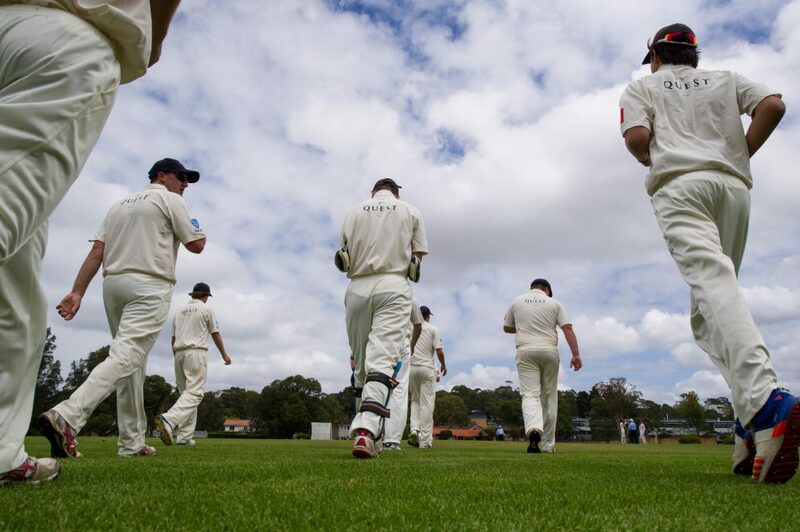 econd grade turned up to Bon Andrews oval on Saturday to be greeted with a rock hard, flat wicket. This was in stark contrast to the green top of last week. We decided to make the most of the batting friendly conditions and pushed on to score 320 with Joel Foster and Nick McLachlan finishing things off beautifully. The plan with the ball was to be full and straight, patient and to grind down the opposition. 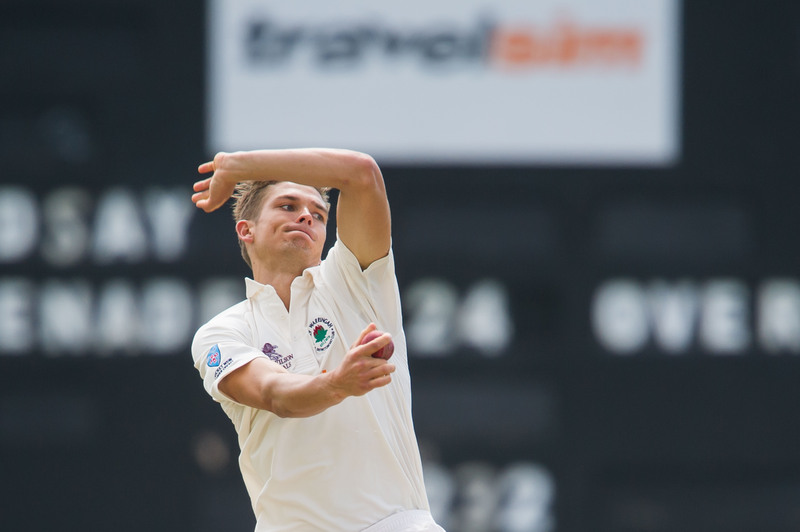 All our bowlers did this tremendously, with Visser and Carden picking up wickets before lunch. The first hour of the middle session belonged to us with Watts picking up his first wicket in 2’s. Some quick scoring and powerful hitting from their skipper gave us a bit of a scare but a great spell of bowling from Foster put us well on top with 3 quick wickets either side of tea. We eventually bowled North’s out with plenty of runs in hand in what was a comprehensive win despite conditions being somewhat against us. The wickets were shared with Foster picking up 3, Carden 2, Visser 2, Watts 2 and McLachlan 1. The only negative was quite a few dropped catches – something to hopefully improve on next match. ith 257 on the board, third grade rocked up confidently on day two at Grahams. The pitch was extremely crumbly and flat and it quickly became evident that the day was going to be a hard slog. North Sydney batted well and were able to reach 0/50 odd and get through to the first drinks break. Ryan Bishop-Perrett was bowling extremely well and he got the breakthrough immediately after drinks. Sam Gainsford had come onto bowl now as well and him and Ryan were bowling well. We were able to build up some pressure and get their number 3 out cheaply. Sam Gainsford toiled well all day and deservedly took this wicket and three more. However their opener was still in and going well. Luckily the skipper Javed came on and dismissed him just before tea which was a huge moment in the game. After tea the opposition captain batted well in the middle order but we were able to chip away and get wickets consistently. Gainsford then bowled the captain with an unbelievable delivery. After that we ran through the tail who did not put up much of a fight. Gainsford finished with four wickets. The skipper took two. Ryan Bishop-Perrett bowled like an absolute machine all day and finished with just the one wicket but deserved more. In the end we were able to grind out a win on a very flat deck, with the boys energy in the field getting us over the line. Its third grades first win of the season and will hopefully be a launching pad for the rounds before Christmas. leven of the greatest pieces turned up to Tunks ready to rissole our cross-town rivals. Touch was played and won mostly thanks to the Alexander/Wilson combination. Those blokes are dynamite. After a quick fielding warm-up before going out to bat (not sure what’s doing here Gumms?) we knew we had to bat time and in partnerships. The general consensus was obviously lost on Nick Cohen who murdered a few of the great boundaries before holing out for his 38th 40 for this great club. Good stuff mate. A few of the blokes threw it away, including Matt Brewster playing a shot you’d usually see from a 40-year-old bloke in his first game, as well as skipper Adam Gummer kicking a fully. At least we looked good. Alas the score kept ticking over and it was a mix of the great Jimmy Crombie and piece-and-skull debutant Jacob O’Sullivan who brought the lads home. The mighty Jacob “Yak” Graham made a quick cameo at the end and just as their skip held out the hand, Gummer gave him the old “nah mate, we’re gonna have a fieldofski”. Great bant all-round. The North’s lads were unimpressed, and so was my Mrs as I turned up to her house an hour later than expected with 2nd degree sunburn all thanks to 15 fruitless overs in the field. Cheers again Gumms. Anyway while there were plenty of ups and a couple downs the Manly boys keep on winning. Bring on Easts next week. Hoo-Rah! he boys rocked up to Mike Pawley Oval and we decided to bat on for around 12 overs or so trying to score quick runs so we could declare and send the opposition in. 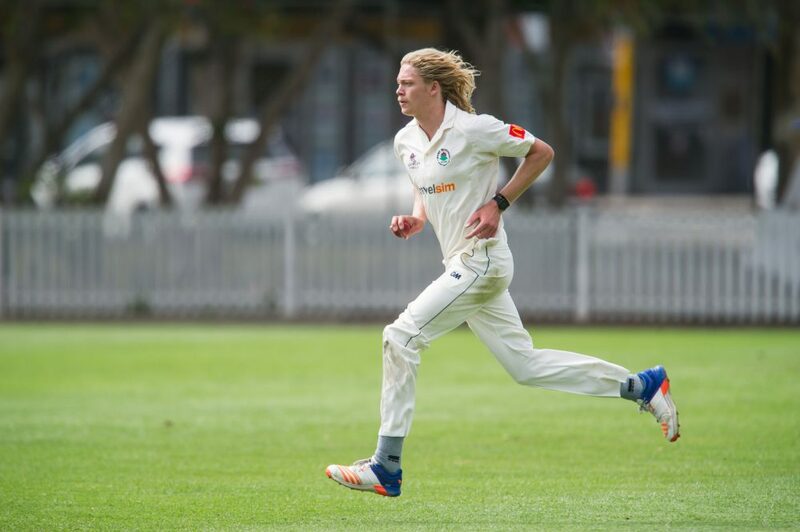 During those 12 over, Dom Wheeler brought up his maiden ton for the club and from there decided to launch an attack towards the poor North Sydney bowlers blasting his way to an amazing 167* while Jack Pickering came in and picked up from where Dom started, hitting a quick 23* and smashing 3 massive sixes leaving the Manly boys on 267. We then declared, sending the North Sydney boys in to bat. 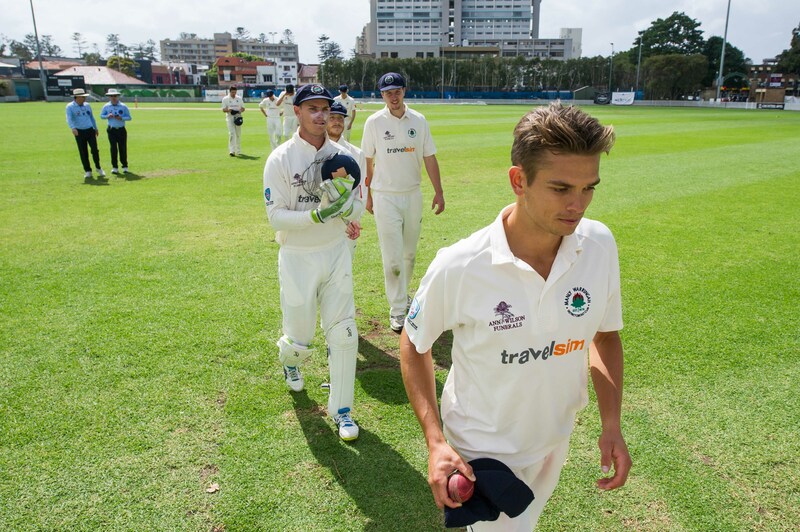 Manly started fantastically with the ball getting some quick wickets but one of the batsmen showed some fight, scoring a solid 50 but we stuck at it, picking up wickets as we went along. Everyone bowled very well with Aidan Bennett and Dylan Marshall getting 2 wickets each including Aidan bowling the North Sydney captain with one of the balls of the day. 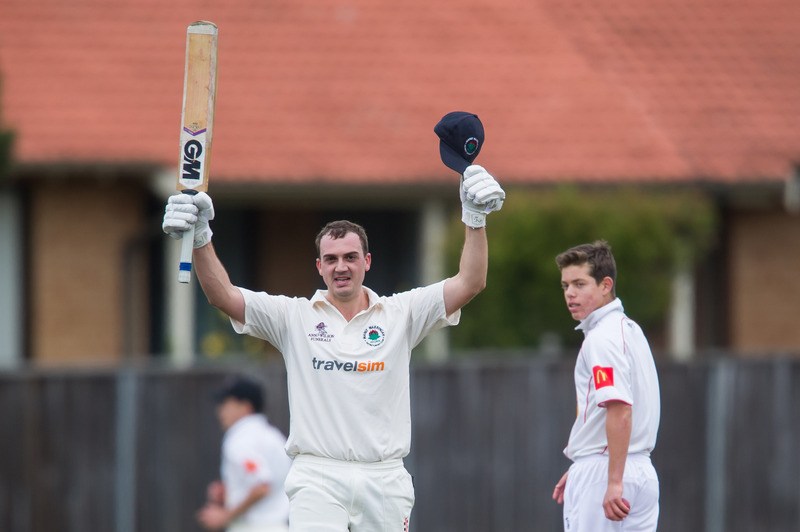 A great performance from Glyn Archer, getting a very well deserved 6/33, which saw the Manly boys pick up at great win. At the end of the day Manly bowled North Sydney out for 176 and was a great win for the boys. nother tough selection process this week, although hopefully we haven’t left out any century makers this week. We can’t really go past our 2 5th grade openers to start the innings off after their record breaking partnership. So Dom Wheeler and Brynn Mendel get us going. Coming in at no.3 is Ahillen Beadle who set up first grades run chase, while Sam Gainsford gets the coveted number 4 spot after his match winning 83 in 3rd grade and brilliant spell with the ball. Chris Green and Jack Edwards are our middle order stallions at 5 and 6 thanks to another brilliant partnership, and Greeny is obviously the no.1 spinner and captain after a stellar round. 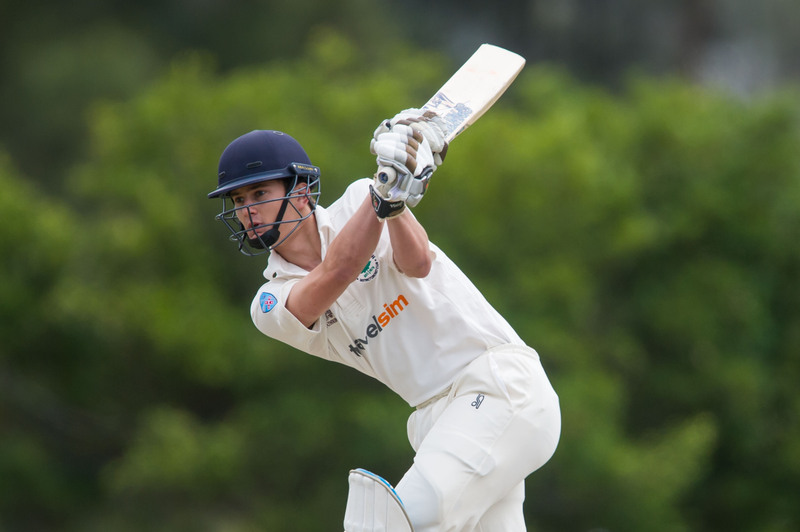 Will Wolter comes in at number 7 thanks to 52 of the best in 3rd grade and strengths the batting line-up. 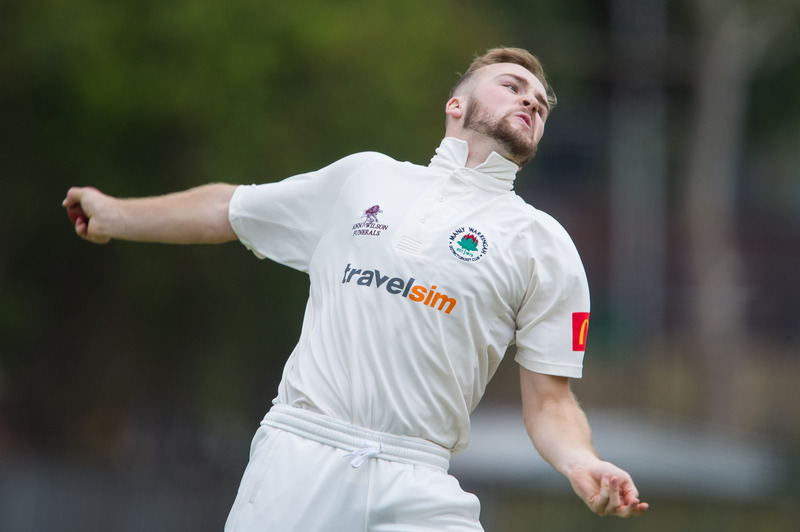 Our 4 pronged pace attack see’s Joel Foster coming in at 8 and opening the bowling after some quality work with both bat and ball. 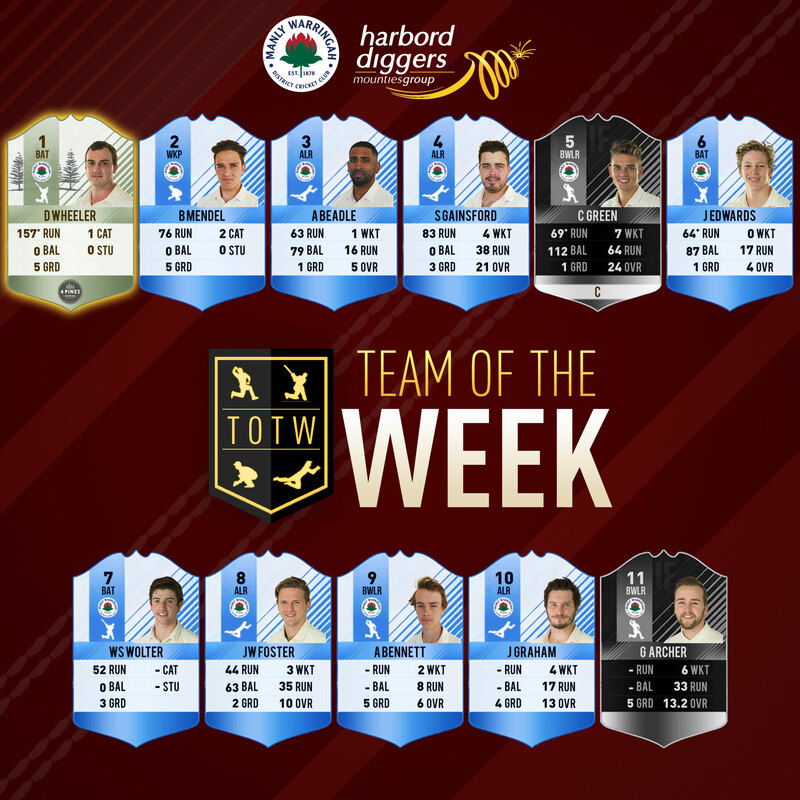 Aiden Bennett took a measly 2 for 8 in 5th grade and gets a start at 8, while Jacob Graham comes in at number 10 after continuing his stellar start to the season. Legs 11 and also opening the bowling is Glyn Archer after taking his best ever figures for the Tahs.